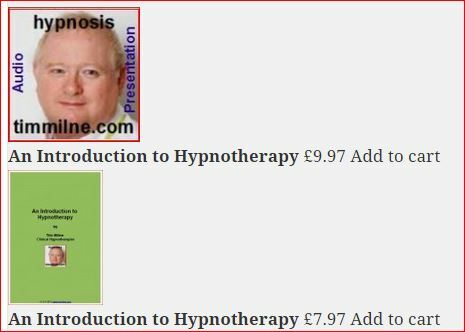 Get your free copy of An Introduction to Hypnotherapy Now! END USER LICENCE AGREEMENT ARTICLE 1: INTRODUCTION This End User License Agreement (“EULA”) is a legal agreement between you and Tim Milne, Clinical Hypnotherapist,. (“Tim Milne”), governing the licence and use of the audio content owned or licensed by Tim Milne and made available for purchase on this website (collectively, the “Recordings”). All use by you of the Recordings is governed by this EULA. Please read the EULA carefully, because it is a legal contract and imposes obligations on you as a user of the Recordings. BY PURCHASING ANY PRODUCT OR SERVICE FROM THIS WEBSITE, YOU WILL BE BOUND BY THIS EULA, AND YOU SIGNIFY YOUR CONSENT TO THE LICENSE GRANTS CONTAINED HEREIN AS WELL AS THE TERMS AND CONDITIONS OF THIS EULA. BY PURCHASING ANY PRODUCT OR SERVICE FROM THIS WEBSITE, YOU FURTHER AGREE THAT YOU HAVE OR WILL REVIEW AND ACCEPT THE TERMS AND CONDITIONS OF THIS EULA BEFORE LISTENING TO ANY RECORDINGS. ARTICLE 2: USER LICENCE 2.1 User Licence. Subject to the terms and conditions and for the limited purposes set forth herein, Tim Milne grants you the limited and non-transferable, right and licence to: (i) download the Recordings you have purchased from this website and listen to the Recordings on devices owned by you; and/or (ii) listen to the compact disc containing the Recordings you purchased from this website on devices owned by you. 2.2 Ownership. You hereby acknowledge that nothing in this EULA is meant or shall be deemed to give you any rights in any works of authorship or copyrights owned or licensed by Tim Milne. In the event that the owner, in whole or jointly, of the Recordings is a party other than Tim Milne, you agree that such party shall be a third party beneficiary under this EULA and shall have the right to enforce the terms and conditions of this EULA that pertain to such party’s rights in and to the Recordings as if such party were a party to this EULA. 2.3 Restrictions. The following restrictions shall apply to your use of the Recordings in any format and on any media: (a) You may not copy or reproduce any portion of the Recordings. (b) You may not distribute, share through any information network, transfer, sell, lease, or rent any of the Recordings to any other person or entity, in whole or in part. (c) You may not change, alter, modify, or create derivative works, enhancements, extensions, or add-ons to any of the Recordings. (d) You may not decompile, reverse engineer, or disassemble any of the Recordings, in whole or in part. (e) You may not use the Recordings for commercial purposes, or purposes other than your personal use and enjoyment. (f) You will at all times comply with, and will not circumvent or attempt to circumvent, any of the restrictions on use set forth in this Section 2.3 or elsewhere in this EULA or the restrictions provided in the U.S. Copyright Act, 17 U.S.C. § 101, et. seq. ARTICLE 3: CHANGES Tim Milne or the owner of this website reserve the right, in their sole discretion, and from time to time, to change the format or content of the Recordings available on this website, or the media on which such Recordings are contained. These updated or re-formatted Recordings may be made available to you for a fee. You agree that from time to time Tim Milne or the owner of this website may remove or disable access to the Recordings for indefinite periods of time, or any portion thereof, at any time, without notice to you. ARTICLE 4: NO MEDICAL ADVICE PROVIDED THE CONTENTS OF THE RECORDINGS ARE NOT INTENDED TO BE A SUBSTITUTE FOR PROFESSIONAL MEDICAL ADVICE, DIAGNOSIS, OR TREATMENT. ALWAYS SEEK THE ADVICE OF YOUR PHYSICIAN OR OTHER QUALIFIED HEALTH CARE PROVIDER WITH ANY QUESTIONS YOU MAY HAVE REGARDING A MEDICAL CONDITION. RELIANCE ON ANY INFORMATION OR HYPNOTHERAPY GUIDANCE PROVIDED IN OR VIA THE RECORDINGS IS SOLELY AT YOUR OWN RISK. ARTICLE 5: DISCLAIMER OF WARRANTIES AND LIABILITY 5.1 Disclaimer. Tim Milne is making the Recordings available to you on an “as is” and “as available” basis and you agree that your use of the Recordings is at your own risk. Tim Milne DISCLAIMS ALL WARRANTIES THAT RELATE IN ANY WAY TO THE RECORDINGS, THE CONTENT OR ANY PORTIONS OR COMBINATIONS THEREOF, EITHER EXPRESS OR IMPLIED, INCLUDING WITHOUT LIMITATION ANY WARRANTY FOR INFORMATION, AVAILABILITY, ACCURACY, ADEQUACY, QUIET ENJOYMENT, NON-INFRINGEMENT, MERCHANTABILITY, OR FITNESS FOR A PARTICULAR PURPOSE. 5.2 Indemnity. You shall defend, indemnify, and hold harmless Tim Milne and its employees and agents, from and against any and all suits, proceedings, claims, losses, and damages (including reasonable attorneys’ fees) related to: (i) any breach by you of this EULA, and (ii) any claim by a third party that arises from your use or misuse of the Recordings. 5.3 Limitation of Liability. IN NO EVENT SHALL Tim Milne OR ITS OFFICERS, DIRECTORS, AGENTS, OR LICENSORS BE LIABLE TO YOU FOR SPECIAL, EXEMPLARY, OR CONSEQUENTIAL DAMAGES ARISING OUT OF OR IN CONNECTION WITH THIS EULA OR YOUR USE OF OR INABILITY TO USE THE RECORDINGS, INCLUDING BUT NOT LIMITED TO LOST PROFITS, LOSS OF DATA, AND ERRORS OR OMISSIONS IN CONTENT, REGARDLESS OF THE FORM OF ACTION, WHETHER Tim Milne KNEW OR SHOULD HAVE KNOWN OF THE POSSIBILITY OF SUCH DAMAGES. THE TOTAL LIABILITY OF Tim Milne, IF ANY, ARISING OUT OF OR IN CONNECTION WITH THIS EULA OR YOUR USE OF OR INABILITY TO USE THE RECORDINGS SHALL NOT EXCEED IN THE AGGREGATE THE FEES ACTUALLY PAID BY YOU FOR THE APPLICABLE RECORDINGS. THE PROVISIONS HEREIN CONCERNING LIMITATIONS OF LIABILITIES AND DAMAGES ALLOCATE THE RISKS OF THIS AGREEMENT BETWEEN THE PARTIES. THIS ALLOCATION IS REFLECTED IN THE ECONOMIC TERMS OF THIS AGREEMENT AND IS AN ESSENTIAL ELEMENT OF THE BASIS OF THE BARGAIN BETWEEN THE PARTIES. EACH OF THE LIMITATIONS OF LIABILITY SET FORTH ABOVE ARE INDEPENDENT OF, AND SHALL SURVIVE THE FAILURE OF, ANY OTHER PROVISION IN THIS AGREEMENT (INCLUDING EXCLUSIVE REMEDIES). 5.4 Errors; Accuracy; Security. Though Tim Milne uses reasonable efforts to ensure otherwise, the Recordings may contain errors or other inaccuracies and may not be complete, accurate, or current. Tim Milne DOES NOT GUARANTEE, REPRESENT, OR WARRANT THAT (I) THE RECORDINGS WILL BE ERROR-FREE, ACCURATE, OR CURRENT, OR (II) YOUR USE OF THE RECORDINGS WILL BE UNINTERRUPTED, ERROR-FREE, OR FREE FROM LOSS CORRUPTION, ATTACK, VIRUSES, INTERFERENCE, HACKING, OR OTHER SECURITY INTRUSION, AND Tim Milne DISCLAIMS ANY LIABILITY RELATING THERETO. ARTICLE 6: MISCELLANEOUS 6.1 Choice of Law. This EULA shall be governed by the laws of the United Kingdom (regardless of the laws that might otherwise govern) as to all matters, including but not limited to matters of validity, construction, effect, performance and remedy. London, UK shall be the proper place of venue for all suits to enforce this EULA. 6.2 Severability. The invalidity or unenforceability of any provision of this EULA shall not affect the validity or enforceability of the remaining provisions, and this EULA shall be construed as if such invalid or unenforceable provisions were omitted, unless the omission of such provision would deprive one of the parties of a material benefit of its bargain hereunder. 6.3 Assignment. You may not assign this EULA. Any assignment made in contravention of this provision shall be null and void for all purposes. 6.4 Binding Effect. This EULA shall be binding on and inure to the benefit of the parties and their respective successors and permitted assigns. 6.5 Entire EULA. This EULA constitutes the entire EULA and understanding of the parties hereto in respect of the subject matter contained herein and supersedes all prior agreements, consents and understandings relating to such subject matter. ARTICLE 7: REGISTRATION AND ACCEPTANCE. By downloading, listening to, or otherwise accessing the Recordings, you represent and warrant that you are 18 years of age or older, capable of entering into a binding legal agreement, and have read, understand, and agree to be bound by all provisions of this EULA. For purposes of this EULA, the “Effective Date” shall mean the date on which you first accepted this EULA by ordering any product(s) or service(s) from this website.